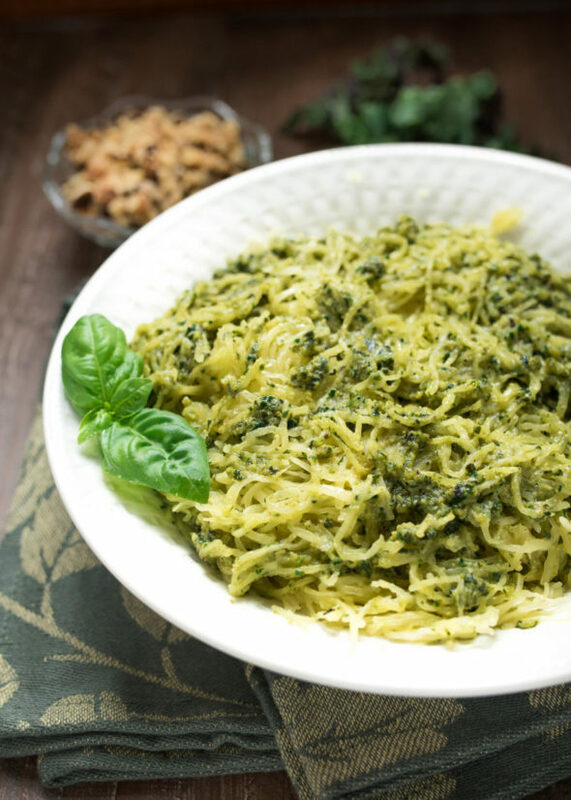 This Spaghetti squash is so easy vegan pesto pairs perfectly with a spaghetti squash for a nutritious side dish. I decided to microwave a spaghetti squash for convenience. I actually kind of prefer the texture of it baked as it seemed to be more tender and a bit caramelized around the edges, but this works! Squash is loaded with nourishing compounds and is an antioxidant-rich source of Vitamin C and beta carotene. I also love that the thick flesh protects the flesh inside and allows squash to store-well. Meaning it’s not likely to go bad in a week like other veggies. It’s a great combo paired with the homemade pesto, one of my favorites! I don’t typically make vegan pesto, in fact I stopped making homemade pesto altogether once my black thumb killed every single basil plant I bought. But good news, the one I planted over Mother’s Day weekend is doing awesome! The pesto took all of 5 minutes while the squash cooked and we had a nice side to go along our leftover grilled chicken and salad. A heart-healthy, antioxidant-rich, vegan pesto spaghetti squash is a great side to any meal. Place spaghetti squash cut side down in a baking dish. Add ~1 inch of water. Poke ~6 slits through the skin of each squash half. Microwave for ~12-15 minutes or until tender. For the pesto, combine all the ingredients (kale through lemon) in a mini food processor. Blend together until pureed. Adjust seasoning as needed. If it's too thick for your liking, add a little more water or lemon juice. Top spaghetti squash with desired amount of pesto. Season to taste with salt and pepper. Enjoy!